Pack your bags folks, because we’re heading to Anitoch, Lima! Today we’re going to check out a truly unique and captivating family property that is sure to impress and delight. Casa Chontay is a has been brought to life thanks to the team at Marina Vella Arquitecta, and is located approx. 40.5 kilometres south east of Peru’s capital. 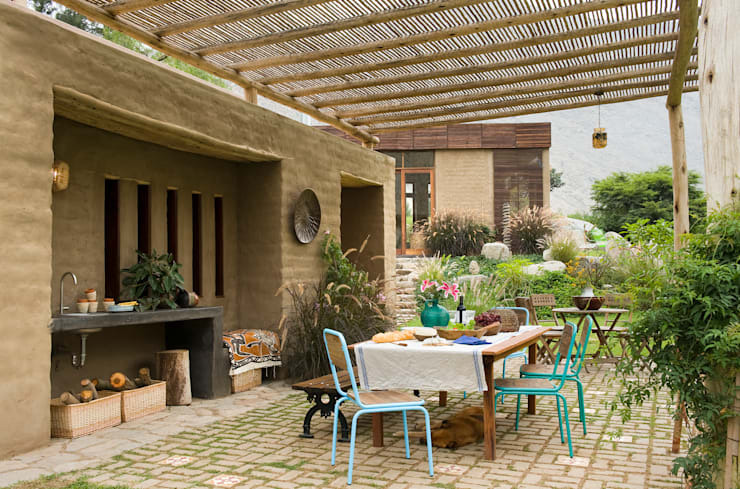 Embracing the scenic flora and fauna, this impressive yet modest, contemporary cottage boasts natural materials of stone, clay and cane, while its east-west situation radiates natural illumination throughout the day. The aim of the project was to generate a sensory, visual and material link between the occupants of the abode, the environment and the architecture. Split into two separate structures, the home utilises its irregular topography to connect users with nature and the outdoors. 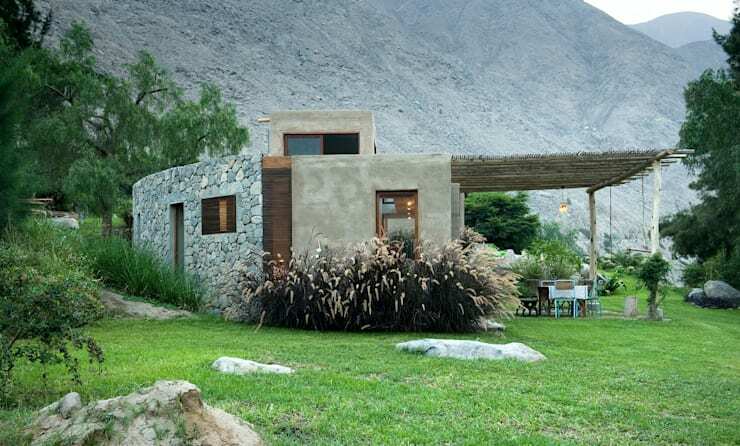 Situated on a 5800m2 plot, this dwelling has a lot of room to work with. And yet, the property that has been built is not gaudy or grandiose – it is appropriately designed to fit the land, and suit its surrounding landscape. Here we are able to see one of the two structures that have been constructed. In making two different and separate buildings, the architects were able to maximise the interesting topography of the land, while enhancing privacy and continuity with the natural surroundings. Inside the home we’re greeted with a truly beautiful design aesthetic. 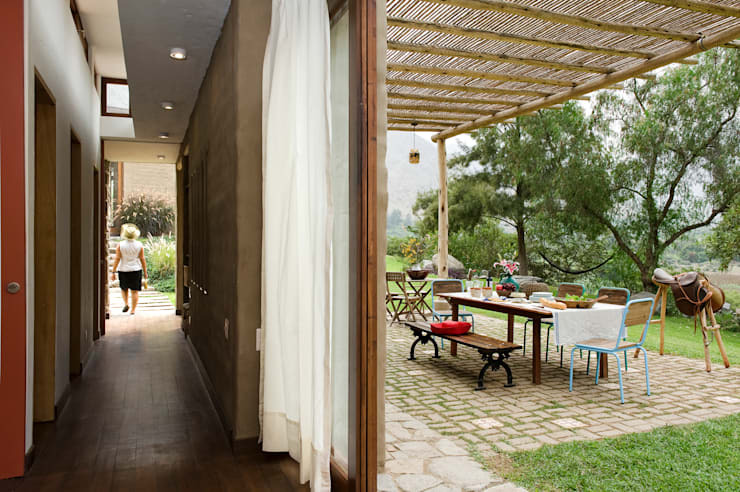 The ambience is a juxtaposition of both modernity and rustic heritage, with plenty of engaging and alluring finishes. The fireplace sets the scene for the room, with a warm and inviting atmosphere, while other natural materials such as the granite dining table bring an element of sleek modernity. 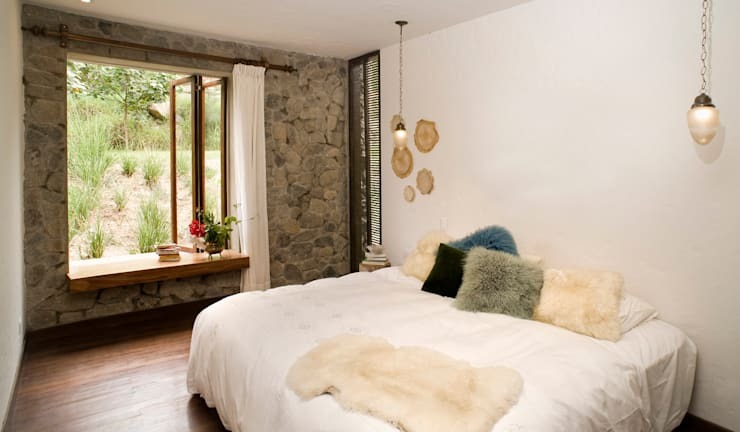 The aura within the cottage is a little more contemporary-chic than it is your typical country retreat; however, the sense of warmth and hospitality has been cleverly retained and included. 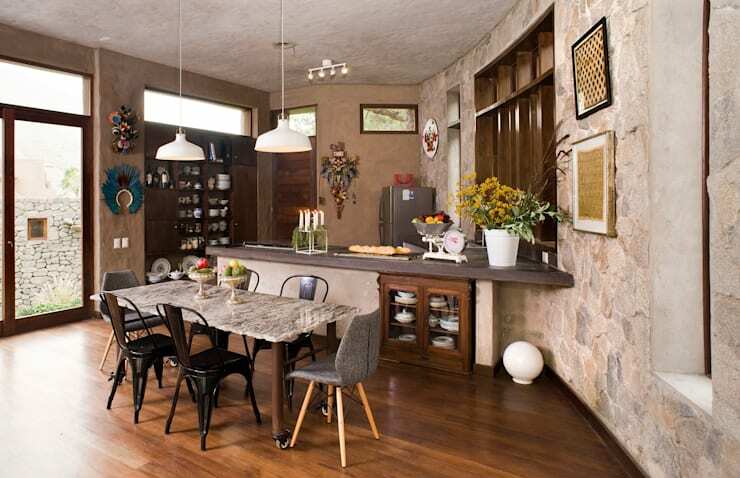 As we turn around to take a peek at the dining table and kitchen, we are able to see the textured stucco walls as well as the exposed stone features. The bright atmosphere that has been created embraces the natural scenery, with timber flooring that reflects the doors, furniture and hardware throughout the home. Tolix dining chairs are a sign of the mid-century modern influences seen within the residence, as well as stylish suspended light fittings, which assist in bringing a sense of separation and individualism to the eating area. Once again this dwelling truly makes the most of its impressive scenery, working with the land to create a fabulous outdoor dining area and kitchen. The furniture in this space is bright and lively, with colourful chairs inviting the occupant to sit, socialise and enjoy their time outside. The kitchen is tucked away into an adjoining wall, and boasts a smart area to cook, clean and prepare events. Of course, as this area is so open and well equipped with amenities it is the ideal space for an avid entertainer and party-thrower! In this image we see the outdoor dining once again, but are given a glimpse into the interior hallways as well. This allows us to see how the architects and designers have worked to join to two spaces, while bringing the outside ‘inside’. 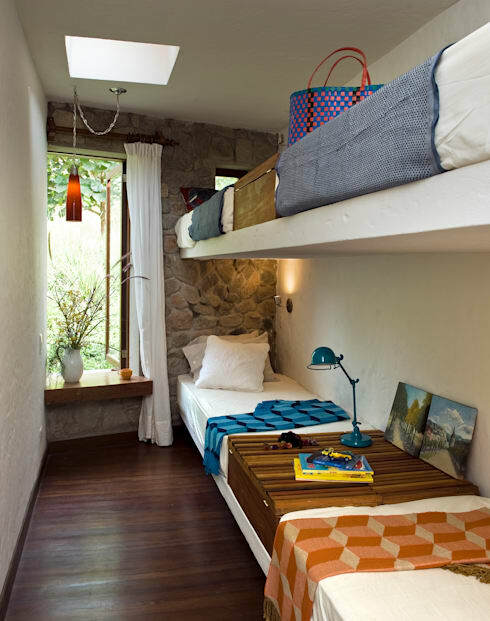 A wonderful bedroom for children, this multi-bunk space offers sleeping quarters for four, with built-in furniture and a seriously cheerful aesthetic. Playful, cosy and exciting all at the same time, this is perfect for families who visit, and imparts a sophisticated yet youthful ambience. Making the most of the views within each room, we head into a bedroom to check out what is on offer. 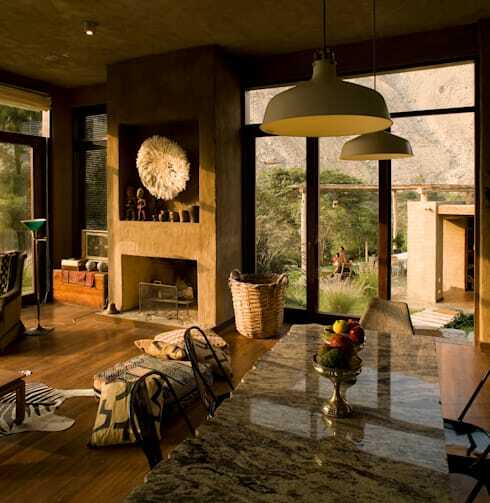 In this sumptuous space a large window connects the individual with the stunning vegetation outside. The furniture is simple, and once again pairs contemporary thinking with rustic charm. Moving into the master suite the colour scheme is bright and engaging, with plenty of chic inclusions that add to the overall sense of style. The room is casual and easy-going with a laid back ambience of comfort and friendliness. 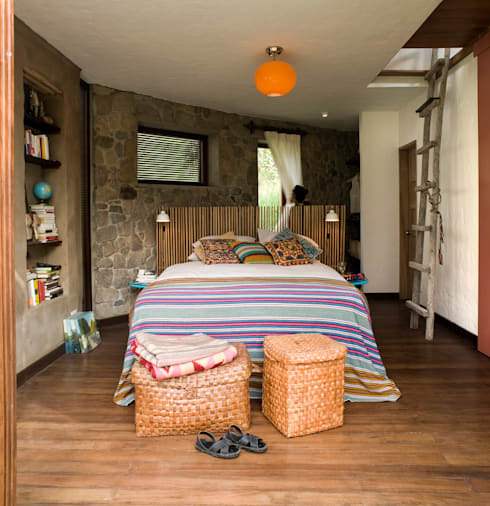 To the right of the bed a small ladder leads up to a secret room, and enhances the individual living areas within this space. As we take one final look at this home before ending our tour we head back outside to check out the exterior façade and its setting amongst the truly unique landscape. The home, although recognisable, is truly at one with nature and the environment. Embracing these natural materials throughout the construction has assisted with the overall sense of cohesion and unity, forming a balanced and highly enjoyable abode. 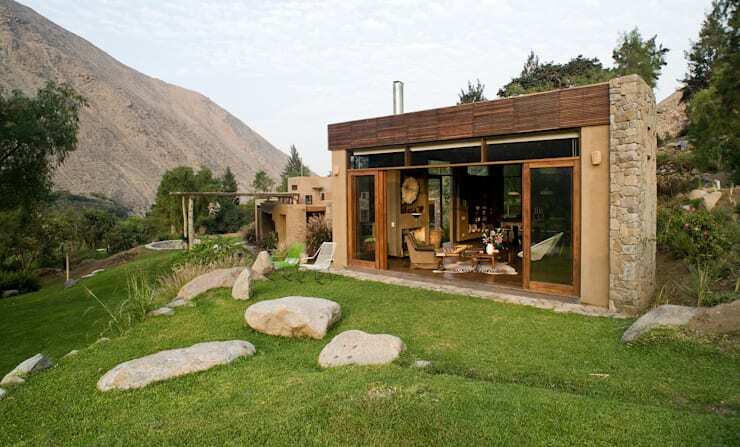 Would you like to escape to this Peruvian dream home?